228 pages | 3 B/W Illus. The value of this collection lies in the underlying foundation and principle of a nothing about us without us approach by the editor, Michael S. Jeffress in collating contributions that effectively highlight scholars in the field who are leading the way in challenging the status quo of disability and curriculum design in higher education. These scholars illuminate the pathway for further reform in disability studies and for transforming the higher education environment. The pedagogical strategies suggested in the book may be adapted and also useful in many other courses in the higher education environment. 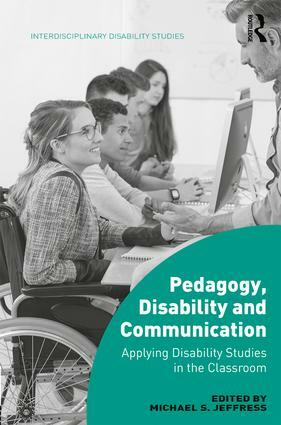 Pedagogy, Disability and Communication is essential reading and a valuable resource for scholars, students, and researchers who value practical examples of pedagogy supported by theoretical underpinnings which challenge notions of disability through their curriculum and ultimately co-create new understandings and meanings of disability in higher education courses. This valuable collection of interdisciplinary essays not only helps in understanding the complex challenges of negotiating disability identity, but through philosophical and theoretical foundations and practical examples it provides various step-by-step manuals to communicate ethically and inclusively in the classroom with one another. Michael S. Jeffress (Ph.D., Regent University) is a Lecturer in Communication Studies in the Department of Literary, Cultural and Communication Studies at The University of the West Indies in St. Augustine, Trinidad. He has been involved in disability advocacy work since the mid-1990s, after his son Ryan was diagnosed with Duchenne muscular dystrophy. In 2014, he received the Top Paper Award from the Disability Issues Caucus of the National Communication Association. His previous title in the Interdisciplinary Disability Studies series is Communication, Sport and Disability: The Case of Power Soccer.